If you’re looking for some inspiration for Christmas gifts you can make this idea, these will probably be well received. They are pretty straightforward and probably quick if you are not constantly being interrupted to get down boxes of Lego, get drinks for people or break up piles of wrestling boys. Fleece fabric, cotton fabric, pencil and paper, the foot of the recipient, usual sewing supplies. 1. Draw round the recipient’s foot. If their foot is small enough, a piece of A4 paper will probably do here. Draw another line around it, adding 1.5 cm all the way round. Draw a line half way down the foot, then across the foot where the toes start. 2. 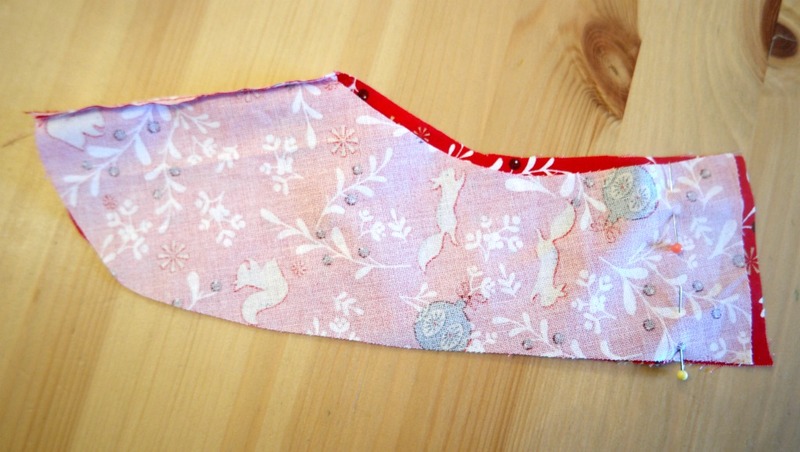 To make the upper part of the slipper, take a piece of kitchen towel (you might need more than one). Drape it over the same foot so that half of the foot is covered. Draw round the base of the foot, half way from the heel to half way round the toes. Then mark where the seams will be, up the heel and along the toes. Then draw on where you would like the top edge of the slipper to be. Unfortunately I forgot to take any photos of this stage, but this is the shape you should end up with. These are the fleece uppers pinned together ready for sewing. 3. Take your upper pattern piece (that you made with the kitchen towel) and add 1.5 cm to the bottom edge. Add 1 cm to where the seams will be over the toes and at the heel. Add another 1 cm along the top edge. 4. Using the upper piece and the bottom piece as a guide, make the pattern piece for the other half of the foot. The way to do this is to copy the upper section as far as the toes, then use the bottom piece as a guide for drawing the toes. 5. You might like to transfer your kitchen towel pieces to paper. 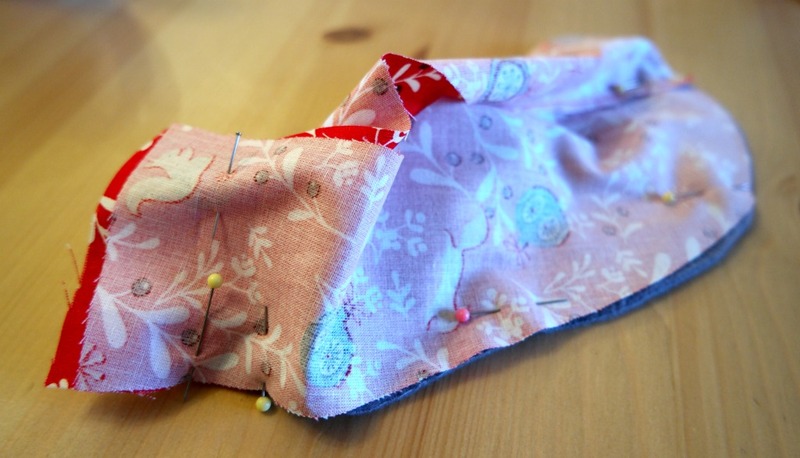 Fold the fabric in half first so that you get the right number of bits the right way round! From the fleece fabric, cut 4 foot shaped pieces and and 2 of each upper. From the cotton fabric, cut 2 of each upper. 1. 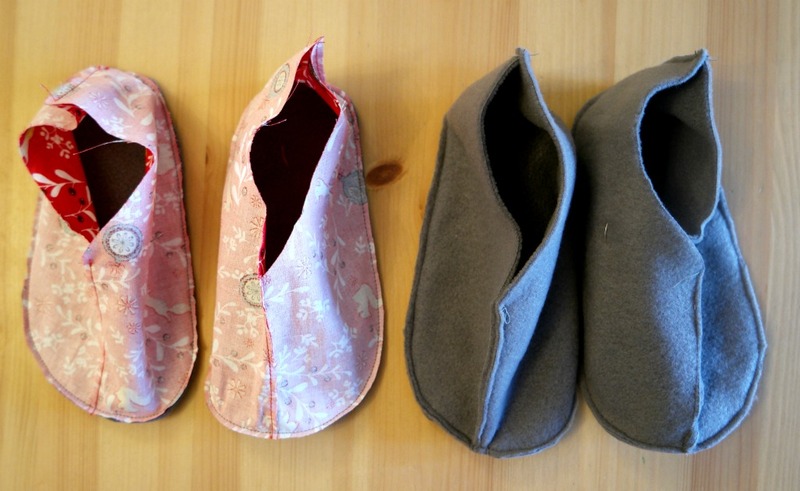 Take one of each cotton upper and, with the right sides together, sew along the toes seam. Before sewing, make sure that you have 1 for each half of the foot, ie not 2 the same! Trim the seam and press. Repeat for the other cotton uppers and the fleece ones. 2. Pin one of the cotton uppers to one of the foot pieces, checking that the bits are for the same foot! When you’ve pinned it all the way round, pin the heel seam. 3. Keeping the heel seam pinned, unpin the rest of the upper from the sole. 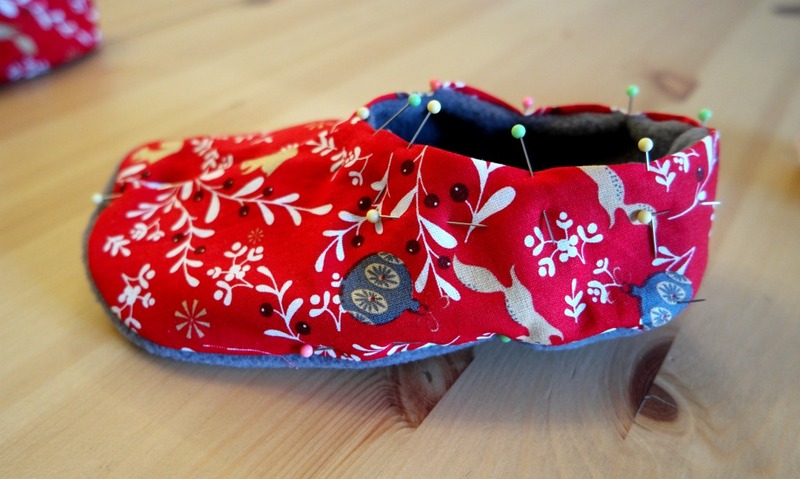 Sew the heel seam. Trim and press. 4. Pin the upper to the sole again. 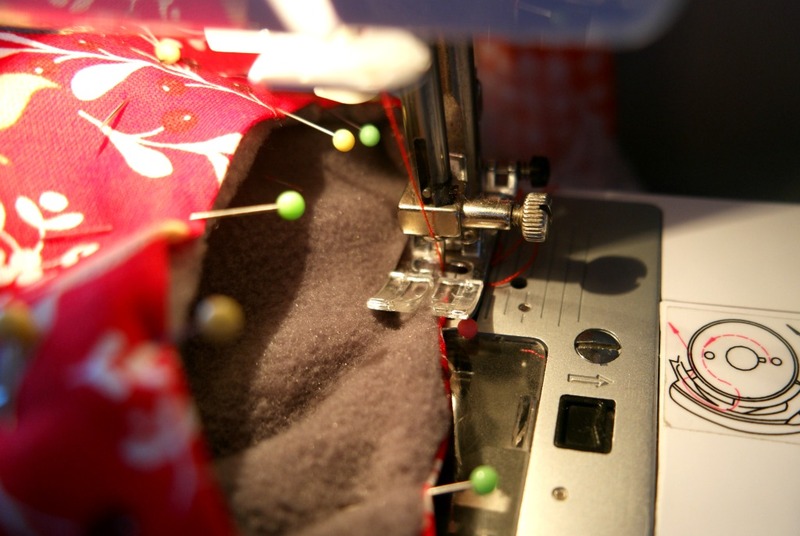 Sew all the way round. Trim the seam closely. 5. Repeat steps 2 – 4 with the other pieces. 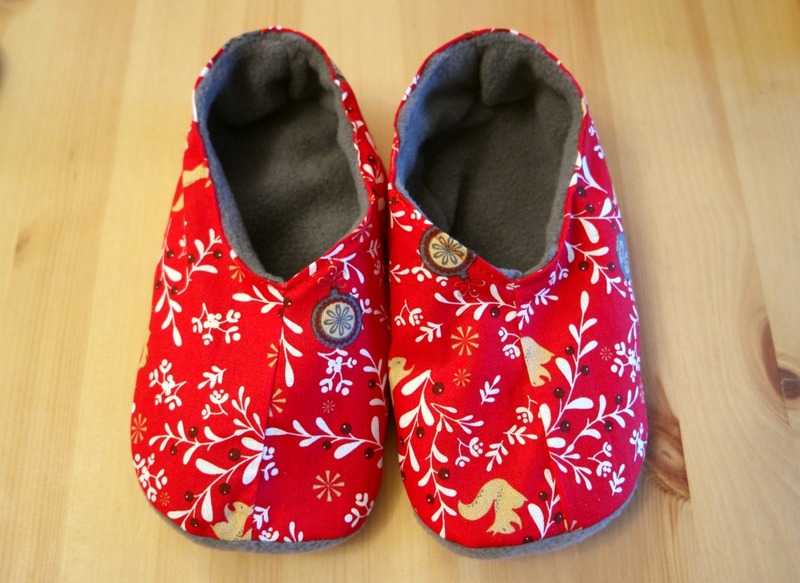 You should end up with 4 little shoes, 1 cotton and fleece and 1 just fleece for each foot. 6. Turn the cotton and fleece slipper bits the right way out. Take the fleece slipper for the same foot and slip in inside. Make sure that you’ve pushed it right the way in. 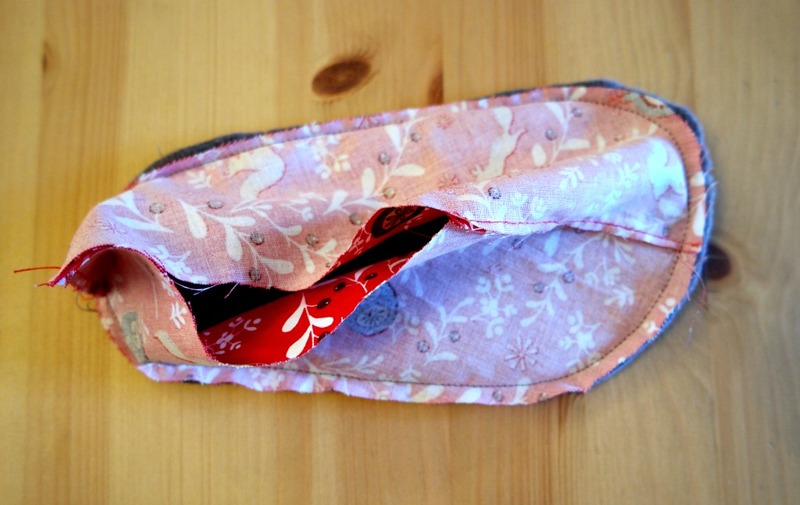 You might it helpful to pin the lining and the outer together. 7. The top edges of the slipper need to match. I found at this point I needed to trim the inside slipper a little bit. Once you have them the same size, fold the lining and the outer inwards about 1 cm, so that the raw edges are enclosed between the lining and the outer. 8. Top stitch around the top of the slipper. Repeat with the other slipper. If you’ve made them for yourself, the only thing left to do is to put them on and enjoy them! If you’re making Christmas gifts for people, you might like to take a look at these tutorials.